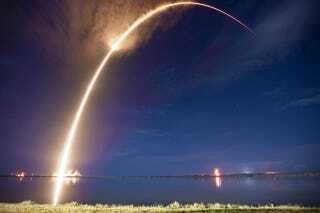 SpaceX successfully launched, carrying the AsiaSat 6 satellite to a geosynchronous transfer orbit. The Falcon 9 launch was initially delayed due to concerns after a SpaceX test flight exploded in late August. The launch went perfectly, and communications are established with the satellite. The launch was originally scheduled for 12:50am eastern time on Wednesday August 27th, but was scratched when a Falcon 9 test vehicle error triggered an explosive self-destruction. The review of the test vehicle malfunction is that a blocked sensor port triggered the self-destruct; the same failure on an operational Falcon 9 would have been overridden by other functional sensors. Even so, as Musk wrote in a public statement, "What we do want to triple-check is whether even highly improbable corner case scenarios have the optimal fault detection and recovery logic." The triple-check pushed the launch date back until early on Sunday, September 7th. The launch window remained the same: the launch needed to take place between 12:50 am and 4:04 am Eastern time to slot the satellite into the appropriate orbit. Lightning striking a protective tower within hours of the launch window. Image credit: SpaceX via Mr Manhatten. While the forecast was for a 70% chance of weather clear enough to launch, and the Cape under a lightning warning, everything cleared up enough for the Falcon 9 to lift off and blast into space without delays. The AsiaSat 6 satellite is a communications satellite for video broadcasts and data services in China and Southeast Asia. AsiaSat has already established communications with the satellite. After extending solar panels and communications antennas, the satellite will manoeuvre to its operational orbit above the equator and begin functioning within months. This is the second AsiaSat mission launched by SpaceX; AsiaSat 8 launched at 4:00 am on August 5th. The satellites are part of a growth plan for AsiaSat, not replacements for aging infrastructure. Read more about the satellite and the launch on Spaceflight Insider. Due to the payload weight, a soft landing recovery of the rocket will not be attempted.